What would you do if you found a wallet full of cash? In today’s episode we will be discussing money and honesty. ਤੁਸੀਂ ਕੀ ਕਰੋਗੇ ਜੇ ਤੁਹਾਨੂੰ ਪੈਸਿਆਂ ਦਾ ਭਰਿਆ ਇੱਕ ਬਟੂਆ ਲੱਭੇ? 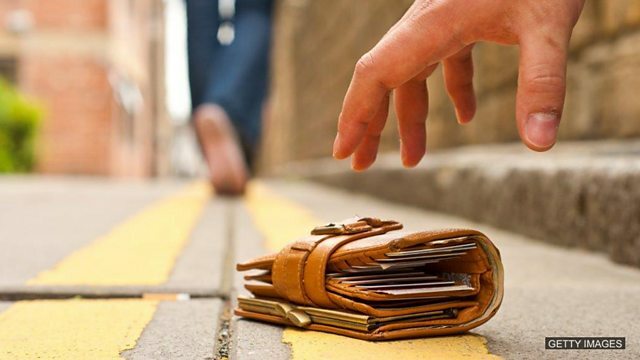 What would you do if you found a wallet full of cash? In today’s episode we will be discussing money and honesty. ਅੱਜ ਅਸੀਂ ਪੈਸਿਆਂ ਬਾਰੇ ਗੱਲ ਕਰਾਂਗੇ। ਉਚੇਚੇ ਤੌਰ ਉੱਤੇ, ਜੇ ਪੈਸਿਆਂ ਦਾ ਭਰਿਆ ਹੋਇਆ ਬਟੂਆ ਤੁਹਾਨੂੰ ਕਿਸੇ ਗ਼ਲੀ ਵਿੱਚ ਲੱਭ ਜਾਵੇ। ਕੀ ਕਰੋਗੇ ਪੈਸਿਆਂ ਦਾ? ਆਪਣੇ ਕੋਲ ਰੱਖ ਲਓਗੇ ਜਾਂ ਵਾਪਸ ਕਰ ਦੇਵੋਗੇ? ਇਸ ਸਵਾਲ ਦਾ ਜੁਆਬ ਲੱਭਣ ਲਈ ਇੱਕ ਤਜ਼ੁਰਬਾ ਕੀਤਾ ਗਿਆ, ਦੁਨੀਆਂ ਭਰ ਦੇ ਵੱਖ-ਵੱਖ 16 ਸ਼ਹਿਰਾਂ ਵਿੱਚ 12 ਬਟੂਏ ਸੁੱਟੇ ਗਏ ਪਤਾ ਕਰਨ ਲਈ ਕਿ ਕਿੰਨੇ ਲੋਕ ਪੈਸੇ ਵਾਪਸ ਕਰਦੇ ਹਨ। ਕੀ ਸੋਚਦੇ ਹੋ ਕਿਹੜਾ ਸ਼ਹਿਰ ਸਭ ਤੋਂ ਵੱਧ ਇਮਾਨਦਾਰ ਹੋਵੇਗਾ? It depends. How much money are we talking about? What would you do if you found a wallet full of cash - $1,500 to be exact? Would you return it? A recent incident in California might surprise you. A teenager was seen on surveillance footage returning a wallet with $1,500 inside. It happened outside a home in California after the young man found the wallet filled with $1500 in cash and credit cards in the driveway of a neighbour’s home, proving that there are still good people out there. $1,500? That’s a lot of money! Yes, it is! I’d be absolutely devastated if I lost that amount of money! And the people who lost the wallet were probably devastated! That is so much money to lose! Yeah, but when they got it back they were probably completely thrilled! Imagine how happy they were to get their wallet back. "Absolutely thrilled” ਮਤਲਬ ਖ਼ੁਸ਼ ਜਾਂ ਉਤੇਜਿਤ । Yes, what a relief! I think I’d be thrilled if I found that much money on the street! Really, Tom? Would you seriously think about keeping the money if you found it on the street? I’d probably think about it, yeah. I mean, if someone is carrying around that much money in their wallet and they lose it, that’s their fault, really! They should be more careful! Ok, true, but it is quite easy to lose a wallet. I mean, we’ve all done it. Yes, I have, and I was very upset. Well, I haven’t. I always know where my wallet is. Well, then you don’t know what it feels like to lose something that’s valuable to you. You can feel totally heartbroken. Exactly! When I lost my wallet a few years ago, I was more heartbroken about losing my photos than anything else. I suppose, to be fair, I probably would be more likely to return a wallet if it had personal things in it. ਠੀਕ ਹੈ, ਇਸ ਸੰਬੰਧੀ ਉਸ ਪ੍ਰਸ਼ਨ ਬਾਰੇ ਗੱਲ ਕਰਦੇ ਹਾਂ ਜੋ ਤੁਹਾਨੂੰ ਪਹਿਲਾਂ ਪੁੱਛਿਆ ਗਿਆ ਸੀ। ਤੁਸੀਂ ਕੀ ਸੋਚਦੇ ਹੋ ਇਹਨਾਂ ਵਿੱਚੋਂ ਕਿਹੜਾ ਸ਼ਹਿਰ ਸਭ ਤੋਂ ਵੱਧ ਇਮਾਨਦਾਰ ਹੈ? Oh, Phil, if only you’d lost your wallet in Helsinki, eh?! Yeah, that would have been good! I might have got it back. I would have been absolutely ecstatic if that had happened. Do you know what would make me ecstatic? So then I could give it back to you. How would you feel if someone you loved moved far away? How would you feel if you won a lot of money? How would you feel if you could meet your favourite singer? How would you feel if your favourite pet died?